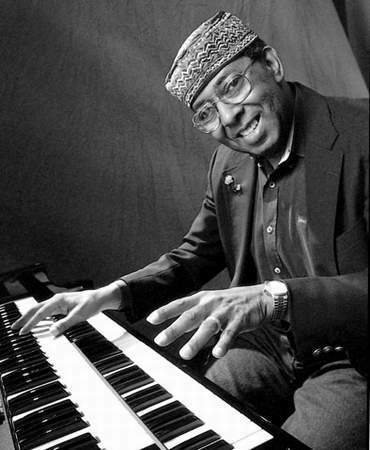 Jimmy McGriff once said to me of the Hammond organs, "These instruments are like Steinway pianos." This was a powerful statement for me. Steinway evokes images of serious pianists spending hours, daily crafting and perfecting their art. These pianists take their art seriously. At the time I was just starting to discover the Hammond organ and its use in jazz music. Getting to see McGriff in Austin the 3 or 4 times he showed up here was a crash course in jazz organ education and inspiration. His statement really connected for me the seriousness of this instrument, its masters and their music. McGriff is one of those masters. He was born on April 3, 1936. His parents were both pianists, but he started out on bass and saxophone, later picking up drums, vibes, and piano. Many of the first jazz organists were both bass players and pianists, and these instruments offered great experience. There was no school other than the one of hard knocks to learn the craft of getting the bass together with the chords and melody simultaneously. McGriff studied at Juilliard and at Philadelphia's Combe College of Music. Things really started for him when the golden age of organ jazz began. Influenced by Wild Bill Davis and others, as well as having studied with Jimmy Smith, he credits playing in his church as one of the biggest influences in his life. He has also always resisted being pigeonholed as a jazz organist. McGriff prefers to think of himself as a blues organist. Blues is certainly part of the jazz organ tradition, but he can keep up with the others just fine. In fact, the Big 3 having formed the backbone of jazz organ history are often referred to as Smith, McGriff and Jack McDuff. His arrangement of Ray Charles 'I've Got A Woman' secured his first recording contract with Sue Records in 1962, as well as his future as a jazz organist. Many other tunes were recorded during this time, including his own 'All About My Girl'. You can listen to McGriff's 'All About My Girl' in it's entirety at http://www.hammondheroes.com/, which is featured on a trailer for a documentary currently in progress about jazz organ. McGriff's gospel and blues influence is very strong in this recording. The intro could have easily come from a gospel shout, and his melodic material is very heavily blues drenched. Recordings from this era are currently available from Blue Note under 'Jimmy McGriff's Greatest Hits'. This recording showcases his gospel and blues talents on the organ in 17 songs, some written by himself, others written by pop artists of the time such as Sly Stone, and James Brown, such as 'Ain't It Funky Now'. As the style is more blues and pop oriented, one will notice the brevity of these recordings, compared to Jimmy Smith's longer jam sessions. These were recorded to be played on the radio, and average no more than 4 minutes apiece. Another one of my favorite McGriff CDs is '100% Funk', on the LRC label. In addition to playing the Blues, McGriff gets down with jazz standards such as Yard Bird Suite, It's You I Adore and Sweet Georgia Brown. He is one of the last of the original legends still alive and performing regularly. You can visit his website at http://www.jimmymcgriff.com, where more bibliography info can be found.